Your mission, should you choose to accept it, is to code the shortest Game of Life implementation in your favourite language. GoL is a bit pointless if you can't see what is happening, so there must be visual output of the automaton running, with each turn's result being shown for long enough to be seen! I always wanted to do something with canvas, so here is my attempt (original version online). You can toggle cells by clicking (also possible in running mode). You can now also try the new version here. Unfortunately there is an issue I couldn't work around yet. The online version is 11 characters longer because jsFiddle puts a text node just before the canvas (why?) and thus the canvas is no longer the first child. Edit 1: Lots of optimisations and restructurings. Edit 2: Several smaller changes. Edit 3: Inlined the complete script block plus minor changes. I went for maximum golfage, with just enough interface to satisfy the question. The numbers in the list represent the coordinates of the starting cells. The first row is 0-19, the second row is 20-39, etc. Run it in a terminal with 21 rows and it looks pretty snazzy. For your TI-84 series graphing calculator (!). This was quite a challenge, because there is no easy way to write a buffered graphics routine (definitely nothing built in), and the graph screen has only four relevant graphics commands: Pxl-On(), Pxl-Off(), Pxl-Change(), and pxl-Test(). Uses every accessible pixel on the screen, and wraps correctly. Each cell is one pixel, and the program updates line by line horizontally to the right across the screen. Because the calculators have only a 15MHz z80 processor and BASIC is a slow interpreted language, the code only gets one frame about every five minutes. User input is easy: before running the program, use the Pen tool to draw your shape on the graph screen. Adapted from my entry to a code golf contest at the calculator forum Omnimaga. This code has an additional feature: it detects if it is being run for the first time, and if randomizes the screen state. In subsequent runs it automatically continues the simulation if stopped after a frame is finished. However, it is not a competing entry because it does not wrap the screen; the cells on the outer border will always be considered dead if the graph screen is cleared beforehand. I use the clock state as a flag. At the start of the program, the date/time clock is enabled, and I use the value of the global isClockOn flag to determine whether it is the first iteration. After the first frame is drawn, I turn the clock off. Saves one byte over the shortest other method and about four over the obvious method. The center cell will stay dead, because it is surrounded by exactly five live cells. After each row is completed, the numbers in the array are updated by dividing the existing numbers by 7, discarding the decimal part, and adding 49 times the values of the cells in the new column. Storing all three columns each time through would be much slower and less elegant, take at least 20 more bytes, and use three lists rather than one, because the values of cells in each row must be stored before cells are updated. This is by far the smallest way to store cell positions. The snippet int(3fPart(3cosh( gives 1 when the input equals 3/6, 2 when it equals 4/6, and 0 when it equals 0, 1/6, 2/6, or 5/6. Saves about 6 bytes. If you want to get a feel how this runs, 2nd example in this blog is just a more elaborate version (live Fourier analysis, better interface) of the code above. Example should run right in your browser after free plugin download. 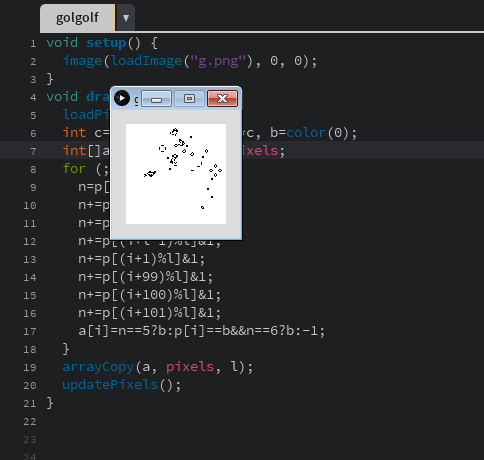 As a challenge, I did this in C using the golf-unfriendly Windows API for real time IO. If capslock is on, the simulation will run. It will stay still if capslock is off. Draw patterns with the mouse; left click revives cells and right click kills cells. Based on this APL version (same algorithm, toroidal convolution). 0 1 1          NB. A glider! A very rudimentary implementation that doesn't use Mathematica's built-in CellularAutomaton function. EDIT: 314 characters, and fixed a bug with extra cells appearing alive on the first iteration. Upped the grid size to 56 since the color routine only looks at the lowest 8 bits. EDIT: Golfed down to 325 characters. Grid width/height is now 28 since 28*9 is the largest you can have while still using the value as the background colour. 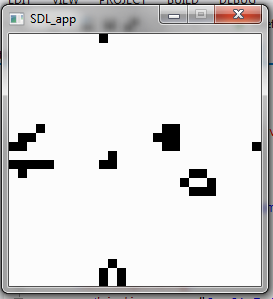 It also processes only one SDL event per iteration now, which obviates the inner loop completely. Pretty tight I think! The simulation starts paused, with all cells dead. You can press any key to toggle pause/unpause, and click any cell to toggle it between alive and dead. Runs an iteration every tenth of a second. The wrapping is a bit wonky. Fun challenge! I welcome any improvements anybody can see. The larger part of the code here is Swing GUI stuff. The game itself is in the actionPerformed method which is triggered by the Timer, and the helper function n which counts neighbours. Compile it with scalac filename and then run it with scala L.
Clicking a square flips it from live to dead, and the menu option starts and stops the game. If you want to change the size of the grid, change the first three values in the line: var(w,h,c,d,r)=(20,20,20,0,false) they are width, height and cell size (in pixels) respectively. We can redirect input from any text source, piped through a tr filter to get interesting initial generations, e.g. 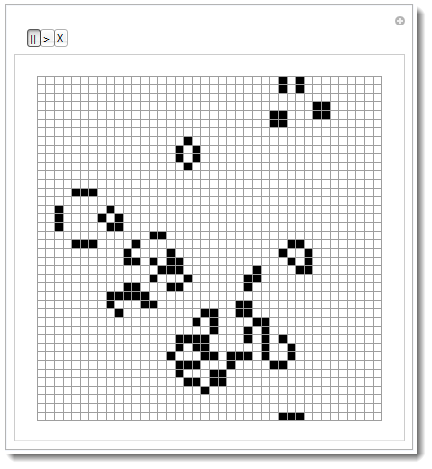 Not totally responding to the challenge, but for the record, here's a Game of Life engine in 130 bytes made by Subzey and I in 2013. Enter a starting pattern by clicking cells to turn them on (alive). Start the game by pressing any keyboard key. The game runs for 99 generations every time a key is pressed (I could have made it 9 to save a char, but that seemed too lame). You can only turn cells on with the mouse, not off, so if you make a mistake you have to restart the program. There are no grid lines, but that doesn't hurt playability too much. Update speed is proportional to CPU speed, so on very fast computers it will probably be just a blur. Living cells are red because "black" uses 2 more characters. The smallness of the cells and the fact that they don't use up all the form space are also character-saving compromises. In tokenised form, this is 1035 bytes. (The ASCII form is, of course, a bit longer.) You get the tokenised form by using the SAVE"life command without appending ",a in the interpreter. This is the maximum-golfed version, but still featureful: upon starting, you get an editor, in which you can move with the cursor keys; space toggles bacteria on/off on the current field, c clears the screen, Return starts game mode. 1003 REM All rights reserved. Published under The MirOS Licence. 1010 PRINT "Initial setting mode, press SPACE to toggle, RETURN to continue"
1020 PRINT "Press C to clear the board, R to reset. OK? Press a key then." I wrote this in 15 minutes while bored and waiting for a friend, who was code-golfing with his “apprentice” for Conway’s Game of Life at the same time. It functions like this: It immediately uses the 80x25 text mode screen buffer (change the initial DEF SEG to use &hB000 if you’re on a Hercules graphics card; these settings work with Qemu and (slower) dosbox). An asterisk * is a bacterium. It works two-pass: first, birthplaces are marked with + and death marks its targets with .. In the second pass, + and . are replaced with * and , respectively. Second and (probably) Final Edit: Managed to golf an extra 21 bytes after finding these (imo) goldmines - definitely recommend new people to read these (especially if you're going to try some of these challenges using Java). Yes, there's a catch with my approach. 4 code bytes plus the ∊nlist and Torus flags. Run as a script. A mouse click on a square toggles it on or off and any key starts or stops generation. I thought I'd give J a try. It's not particularly well golfed yet, but I'll give it another try soon. I dont have Matlab installed right now to test it, I just golfed the code that I wrote a few years ago. As the program runs Game of Life, every state is dumped to the standard output in a format similar to the input, then delays 0.1 seconds. The delay can be customized by changing the fourth argument of the select call. The game board is hard-coded to size 79x23. It is wrapped in a torus: if you leave the board on the bottom, you end up at the top; if you leave on the right side, you end up at the left side but shifted one row down. This code is derived from an obfuscated game of life perl program I wrote years ago. I have changed it a lot to make the board toroidal and golf the code. This is probably not the shortest method to implement Game of Life in perl, but it's one of the less comprehensible ones. The board is stored in $b as a string of '1' and ' ', one for each cell, only the whole thing is repeated at least three times. The third unpack call extracts 17 values for each cell: there's one for the cell itself and two for each of the eight neighboring cells, in an arbitrary order, and each value is '1' or an empty string. The cell should be live in the next iteration iff the number of '1' values among these 17 values is 5, 6, or 7. The third pack call concatenates these 17 values to a 18 character wide field left aligned and padded with nul bytes on the right. The second unpack call takes such a 18 wide field, dispatches on the character at position 7, unpacks the space from position 17 if it's a '1', or unpacks the character from position 4 otherwise. This result is exactly the value the cell should have in the next generation. Mouse buttons: left - put a cell, right - remove a cell, middle - start/stop. And here is a version where you can drag mouse to draw. Graphics are a bit more pleasant. I believe this satisfies all of the requirements. While I know this is an old post, I couldn't help myself from giving it a shot. The initial board can be any size as long as you draw a border around it and have an extra space on the last line. Started with the example from Rosetta Code. Invoke with a filename argument (gs -- gol.ps pulsar), the file containing 20*20 binary numbers (separated by space). Infinite loop: draw board, wait for enter, calculate next generation. Spaced, with a few stack comments (just the ones I needed). Sorry Griffin, I just couldn't look at your code and not re-write it slightly... had to shave off two characters but it was damn worth it! Where the 0s and 1s represent dead and live cells, an extra newline at the end begins execution. It's easier to run than the shortest python one, supports any sized grids, and looks pretty when run. It's also 100 bytes more, so there's that. for($s=file(f);                         # import input from file "f"
Create the living cells by highlighting cells in A1:T20 and coloring them black. *When t is run, it executes a single tick. I added a button on mine to click repeatedly. If this doesn't satisfy the requirements, I'll add a do-->while[counta(f)]>0 and a DoEvents for +34 bytes. Not the answer you're looking for? Browse other questions tagged code-golf game-of-life cellular-automata or ask your own question.